A clean tidy lovely family bach in the old style surrounded by native bush with dual walkways direct from the property down to Stoney Bay and Woolleys Bay. Surf at Sandy Bay (a surfers mecca) or launch your boat or go deep sea fishing at nearby Tutakaka. Fish of the rocks in Stoney Bay or simply relax on a deck chair and enjoy the view. Well provioned bach in private setting with great views. We really enjoyed our stay. We adore this property and this is our second stay. It has everything you need and more. We are pretty committed foodies and the kitchen catered totally to our habits. The layout accommodates two families with a range of spaces to hang. Expect another booking from us. Many thanks. This bach is a bit like being on a ship but on dry land, due to it sitting on the saddle of a headland with the gentle wash of the east coast waves to lull you to sleep at night. The outline of the house is also ship like, being long and narrow with the sleeping quarters at one end and the galley at the other. The out door entertainment area continues the theme with a couple of shade sails over an impressive, slabbed construction, Macrocarpa Table. On a Summers evening this would be a very pleasant place for alfresco dining but as we had northerlies for much of our stay we didn't get to utilise it as much as we would have liked. The indoor area has a large table that is also very convivial. The bird life is phenomenal, with the sound of Kiwi calling out at night and Tui singing to each other from the Pohutukawa and Harakeke in the morning. There are private paths on either side of the bach, down to Stoney Bay (very steep and perhaps a little precarious without a hand rail) and Wolleys Bay on the other. 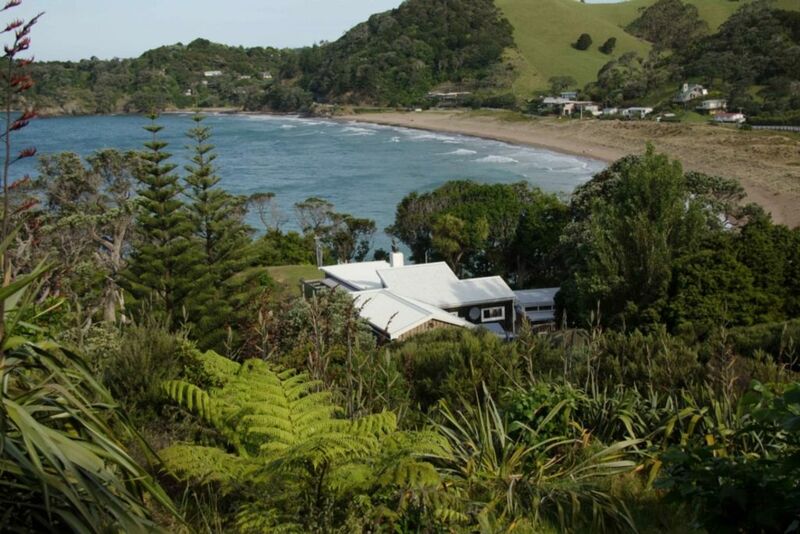 The location is unbeatable for access to stunning Whale Bay and popular Mermaid Pools. The Sleepout is done to resemble a ship's bridge. The outdoor shower is inspiring and it also has a bathroom; handy for members of our group staying there. It was a tad musty due to being closed up and we thought may be enhanced further with the addition of some insect screens. The beds are extremely comfortable and the standard of cleanliness is outstanding. There is a Store at Matapouri Bay, only 5 minutes drive away. It has takeaways and an extensive range of products which we found very convenient. We would definitely return for a vaycay, anytime! iconic nz beach stay, lovely!